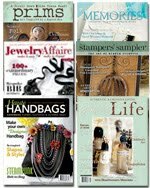 New Stampington and Company titles this month are Prims Art Inspired by a Bygone Era and Jewelry Affaire make it easy make it elegant. Continuing titles include Somerset Life (A/M/J 10), Haute Handbags (Spr 10), Somerset Memories (Spr 10) and Stampers' Sampler (A/M 10). Okay - here are the finished "products!" each of these cards are so different and express the personalities of the participants. Can't wait to try the Royal Card Buffet yourself? Come to the next one on Saturday, April 3, 2010 from 11 a.m. to 4 p.m.! After a while, the studio looked like a food fight had broken out!!! The Thursday group really ate it all up! Up next... the final review! Patti held her second Royal Buffet with her Thursday group (you'll know who you are). I was on the scene to take pictures! This class was held at 10:30 in the morning and if there is one great benefit of our 14 foot windows, it is the bright morning light we have in the studio. Of course, I need to learn how to use my camera to take advantage of the light. But you can see how beautiful the table looks. I love the "Art to Go" labels on the food containers. The little boxes wrapped in ribbon start out empty but throughout the class Patti gives the participants embellishments and goodies to take home and add to their stash! The Buffet is really satisfying (staying with the food theme here). Plenty of inks and coloring tools are available, as well as buttons, ribbons, stickers and card stock. There was so much to offer that a second table was set up to accomodate the extra stamps, punches and stickles Patti wanted to serve. Up next... the Buffet is open!